A black and white portrait photograph of William Douglas Dykes. William Douglas Dykes was born in Britain in 1881. He came to Whitby from Toronto in 1913 and formed a real estate company called the Greater Canada Improvement and Land Company, which subdivided the Webber farm west of Brock Street and north of the Canadian Pacific Railway (C.P.R.). The company also owned a brickyard on the third concession west of Cochrane Street and a lumberyard on Pine Street. 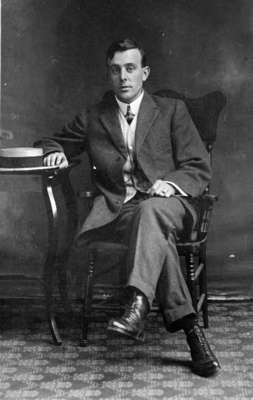 Mr. Dykes was Whitby's Town-Clerk Treasurer from 1923-1925. At this time Mr. Dykes left Whitby for Toronto. Mr. Dykes was a half brother of his successor, John R. Frost. He died on 10 April 1961 in Toronto, Ontario. William Douglas Dykes, c.1923, Photographer Unknown. Whitby Archives 31-004-003.